There are many misconceptions about Panchakarma and the word tends to be overused as a catchall for any type of Ayurvedic treatment. 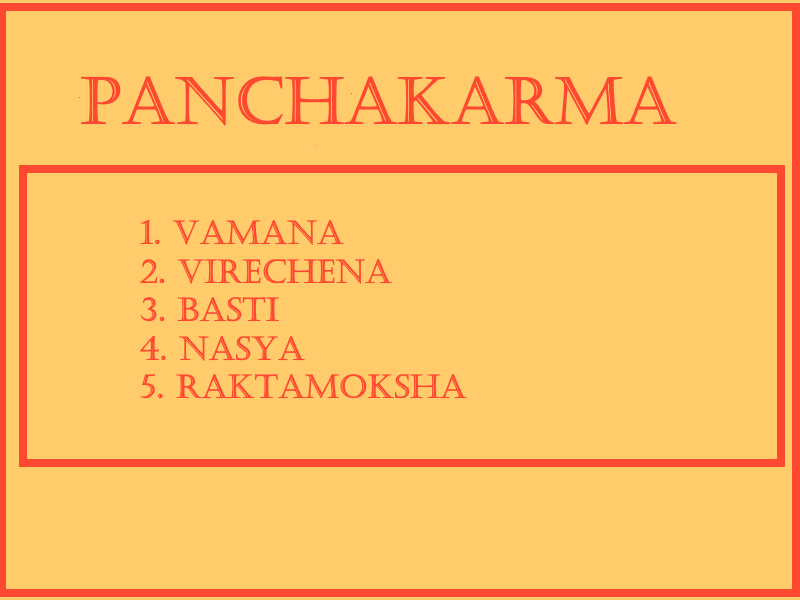 Following is a standard definition for clarification of what Panchakarma really is. Panchakarma literally means Five (pancha) Actions (karma) and refers to five sets of Ayurvedic treatment procedures given to a patient depending on what dosha is out of balance. They are NOT given all at once and are NOT 'standard' procedure for all patients. Prior to Panchakarma, Purvakarma must be administered to prepare the patient for the Panchakarma. Vamana – Emesis treatment. This refers to removing the toxins by means of vomiting. Vamana treatment is given after preparing the patient for vamana procedures. Vamana treatment is usually given for Kapha imbalances. Vamana treatment may take from 3 – 7 days. Virechana – Purgative treatment. This refers to removing toxins by means of purgation. Virechana treatment is given after preparing the patient for virechana procedures. Virechana treatment is usually given for Pitta imbalances. Virechana treatment may take from 3 – 7 days. Basti – Rectal enema. An Ayurvedic enema is quite different from the regular enema given to relieve constipation. Basti treatment is utilized in a wide range of diseases, predominantly of Vata imbalance. There are two types of Basti – Basti with oil and Basti with a mixture of herbal decoction, honey, salt etc. Nasya treatment - formula applied in the nose. Instillation of powders or Ayurvedic liquids through nose is called Nasya treatment. It is usually prescribed for diseases of the ear, nose, throat, headaches, etc. and helps to balance all three doshas and is very beneficial for balancing Kapha dosha. Raktamoksha - Blood letting. Extracting a small amount of blood from a vein relieves the tension created by the pittagenic toxins in the blood. Bloodletting also stimulates the spleen to produce antitoxic substances which help to stimulate the immune system. Toxins are neutralized enabling radical cures in many blood born disorders. Understanding Panchakarma can help you work with an Ayurvedic Doctor or Practitioner to balance your Doshas at a deeper level.